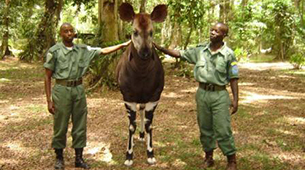 Encroachment from human settlement, illegal hunting, logging, and mining, and the illicit activities of armed groups are serious threats to the Okapi Wildlife Reserve. Add to these the general economic and civil instability of the Democratic Republic of Congo after years of interior conflict, which burdens the government’s ability to react. The Institute in Congo for the Conservation of Nature (ICCN) is a government agency whose imperative is to protect the country’s flora and fauna. 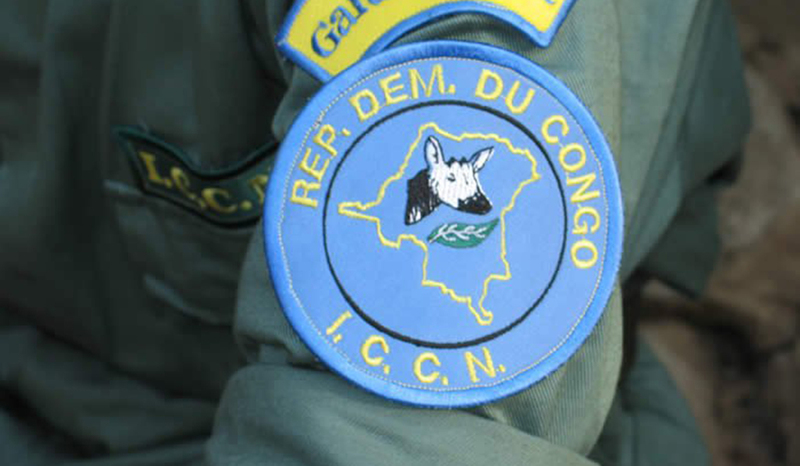 ICCN wardens, rangers and guards share a wide range of protection and law-enforcement responsibilities — collecting snares, evicting miners, pursuing and detaining poachers, monitoring agricultural expansion, and engaging communities throughout the DRC in conservation awareness and education. Hailing locally, ICCN personnel are, at once, a source of on-the-ground networks and information and a source of employment and income for their communities. 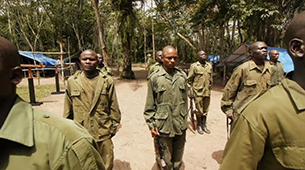 On the front lines of even the most dangerous missions, they were instrumental in the yearlong manhunt that took down the notorious poacher Morgan and his syndicate and the elimination of several experienced elephant poacher rings. Okapi Conservation Project supports and works with the ICCN to ensure the availability of resources for rapid response to threats to the integrity of the Okapi Wildlife Reserve. Healthcare and housing, for ICCN personnel and their families, and equipment, supplies, facilities and infrastructure are costs supported by OCP and its partners. Specialized education and training in not only wildlife management but communications, technology, and language are essential components also sponsored by OCP. 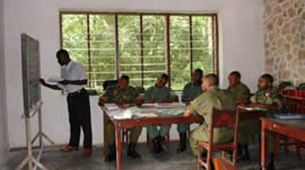 The effective conservation presence provided by a well-equipped and disciplined ICCN guard force depends on assistance from the international community. 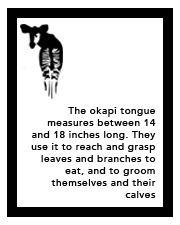 © 2014 Okapi Conservation Project and Wildlife Conservation Global.